Hotel Loretta , 3 stars of Bellariva, is located in a quiet area near the beach. It is managed directly by the owner and has services for children, free parking, free WI-FI and air conditioning. Accepts pets of all sizes. The hotel is located in Bellariva, a fraction of Rimini south well connected to Rimini center and Riccione by the bus line n.11. The beach can be reached on foot in a couple of minutes. Many rooms have been recently renovated. Some have a sea view, all have a bathroom with shower, TV, telephone, balcony, air conditioning, WI-FI connection, safe, courtesy set. Open-air porch, free use of bicycles, bar, panoramic sun terrace, lift and reading room. PARKING: indoor and outdoor, available for free subject to availability. AIR CONDITIONING: available in all rooms, free even in the room. SERVICES FOR DISABLED: entrance on the ground floor with a sloped ramp, a standard elevator. PETS: pets of all sizes are admitted both at the hotel and at the beah affiliated with the hotel. LUNCH AND DINNER: guests have at their disposal a double menu with choice of meat and fish. Pasta and desserts are homemade, drinks are included in the all-inclusive formula. Every day the typical regional dishes are served with fresh pasta, lasagna and fish. OTHER: the restaurant offers evening grills. In the hotel: stroller; pediatrician for a fee. In the room: cots and cribs. At meals: high chairs, baby food, vegetable broths and dedicated menus. On the beach: playground area, live entertainment with baby-mini-junior club. 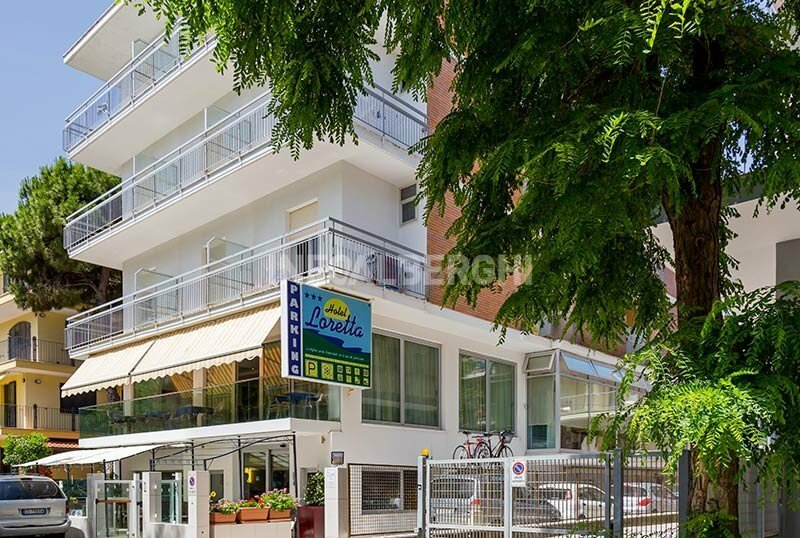 The hotel has an agreement with the Bagno Gibo 85 / be Rimini Beach 86 / a establishments that offer cabins, safety deposit boxes, reading area with newspapers and books available, baby parking, mini club, nursery, table football, entertainment and inflatables. Bagno Gibo offers an equipped dog area and a wellness area with hydromassage baths, massage beds, vibrating platform, shiatsu cushions, hot showers, automatic foot-washer. For sports lovers, at the Rimini Beach there are kitesurfing lessons, gym, table tennis, bowling, aerobics, fitness, water aerobics, yoga and much more. The list prices are per person per day for a min. of 3 nights. TOURIST TAX: Excluded, € 1.50 per person for each overnight stay up to a maximum of 7 consecutive nights, (excluding children under 14).